The Aegis of Healthcare. The Debate on Smallpox, the Jennerian Breakthrough, and the Beginnings of Vaccinations in Italy. On May 8th, 1980, smallpox was officially declared to be eradicated. Before disappearing from the face of the planet, however, the “most lethal and feared disease in human history” had been an affliction which could be tamed only through prevention. With its ancient origins, smallpox was so present in the life of 18th- and 19th-century populations that it sparked a global debate which was scientific, political, and philosophical in nature; the disease pushed brilliant minds to improve preventive systems and induced entire governments to protect the health of their people. In this volume, we recount this history in three parts. We begin with Voltaire’s letter On the Inoculation of Smallpox, then Lezioni di commercio o sia d’economia civile by Antonio Genovesi, and the article Sull’innesto del vaiuolo by Pietro Verri. We follow with the text that represents the turning-point in the history of smallpox: An Inquiry into the Causes and Effects of the Variolae Vaccinae. Here, Edward Jenner recounts the fruits of his labor which, in the end, were beneficial for all of humanity, and created the life-saving smallpox vaccination. 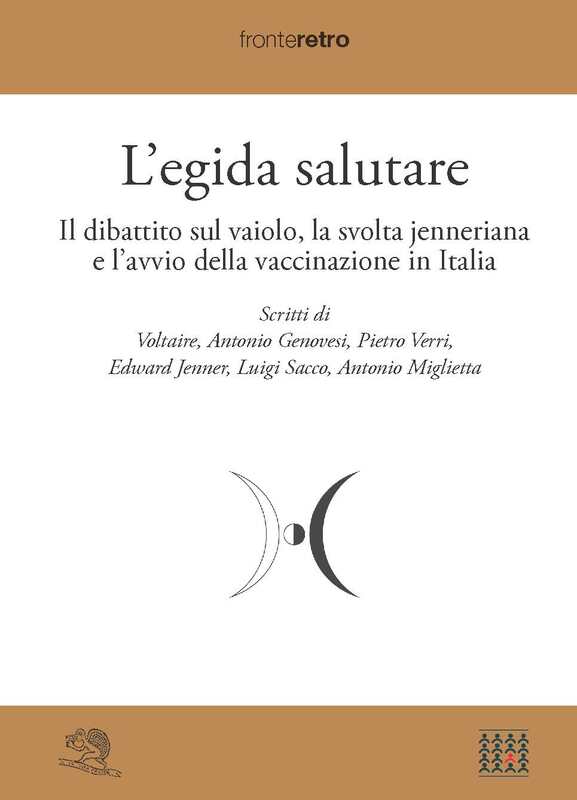 The brief but significant correspondence between Jenner and Sacco acts as the link to the last part of the volume: the beginnings of vaccination in Italy. Memoria sul vaccino by Luigi Sacco, Sull’origine e il merito dell’inoculazione vaccina, and Ricordi salutari by Antonio Miglietta give an idea of how pre-unification Italy was already united in its public health policies. The Omelia sopra il Vangelo della XIII Domenica dopo la Pentecoste serves as the volume’s final testimony. (1694-1778), pseudonym of François-Marie Arouet: writer, philosopher, and one of the main leaders of the Enlightenment. His works include: Philosophical Letters, Philosophical Dictionary, Treatise on Tolerance, and Candide. (1728-1797), philosopher and scholar, organizer of Lombard Reformism, Enlightenment thinker, and founder of magazine “Il Caffe”. His works include: Riflessioni sulle leggi vincolanti, Discorso sull’indole del piacere e del dolore, and Osservazioni sulla tortura. (1713-1769), philosopher, economist, and sacerdote. As the first Economics scholar in Europe, he was part of the vanguard of a prolific era of Italian economic thought. His works include: Logica e metafisica, Delle lezioni di commercio o sia d’economia civile. (1749-1823), doctor, naturalist, and member of the Royal Society. He studied and carried out the world’s first smallpox vaccination. His works include: Observations on the Natural History of the Cukoo, and An Inquiry into the Causes and Effects of the Variolae Vaccinae. (1769-1836), doctor, hygienist, primary of the Ospedale Maggiore of Milan, general director of vaccination, and proponent of the Jennerian method in Italy. His works include: Istruzione sui vantaggi, e sul metodo d’innestare il vajuolo vaccino, Memoria sul vaccino unico mezzo per estirpare radicalmente il vajuolo umano. (1767-1826), doctor and physiologist, director of vaccination factories in Naples, and first academic on the History of Medicine in Italy. His works include: Sull’origine e il merito dell’inoculazione vaccina, and Ricordi salutari.